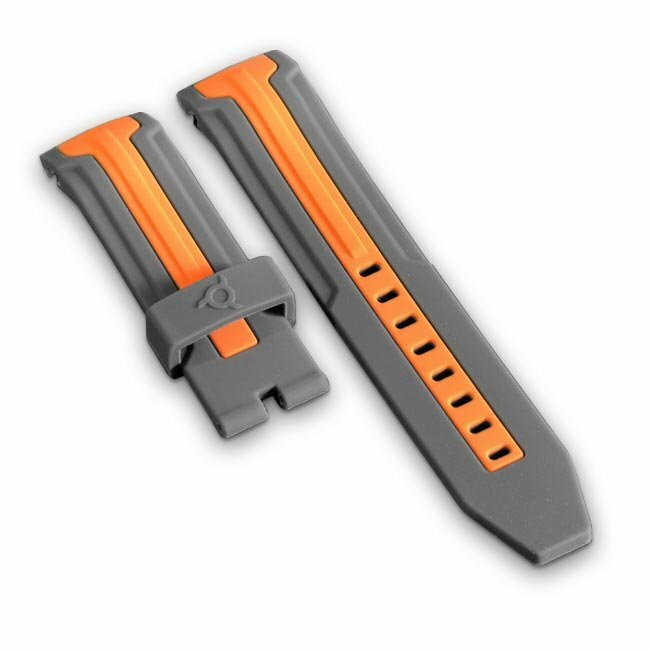 Stylish quality double injection Watch Bracelet Grey Orange for Wryst Ultimate ES50 in silicone. This complex and sporty designer bracelet is a perfect fit for the Swiss sports watch Wryst reference ES50. Attached on the brushed watch case size 45mm diameter of the sport watch Ultimate ES50, this orange and slate grey band is surprisingly stylish and luxurious. The bold and chuncky Ultimate collection with 200 meters water resistance benefit of a sapphire crystal. Exceed yourself and wear a quality and durable Swiss sports watch Wryst. With a totally mind-blowing design, the unusual 45mm Swiss sports watch ES50 is bold and sturdy. Four different bracelets can be fitted on the brushed steel casing holding a dark grey dial with orange details on the hands and hour markers. Choose either to fit the all-black, all-orange, grey and orange or also the bespoke Wryst metal bracelet with deploying clasp. Great for all occasion, this highly collectible timepiece is only produced in a small edition of 99 watches.